Chasing Amazing is looking at Mark’s favorite Amazing Spider-Man covers this week. Today, we look at choices #8 and #7. 8. Amazing Spider-Man #40 – Cover by John Romita Sr.
ASM #40 bucks that trend, making it one of the most memorable Spider-Man covers of the era. The Green Goblin had been a thorn in Spider-Man’s side since he was first introduced in issue #14, and here, right on the cover, we learn that Spider-Man is going to be victorious in this issue. Not just victorious, but “Spidey saves the day!” When I was doing my “stand up and cheer moments” series a few weeks back, I can’t believe I forgot to work this issue into the list somehow. The cover just oozes elation and jubilation. 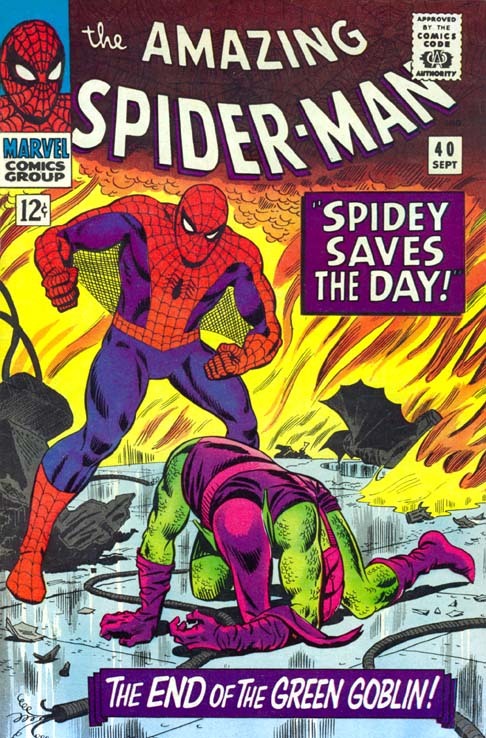 Of course the Goblin would eventually return, many years later, and ultimately screw with Spider-Man/Peter Parker’s life in ways most readers couldn’t have imagined in the 1970s, but at this one moment in time, Spider-Man takes care of business. What also adds to the legend of this cover is the front cover of the issue that preceded it. Now, I’ll have more analysis on ASM #39 later (damn, another *spoiler alert*), but I can’t remember an instance in ASM history where two back-to-back issues were so thematically different from each other in terms of the front cover. The reader is taken on a journey of an unmasked Spider-Man hog-tied by the Goblin to Spider-Man saving the day and restoring order to his world. It helps that the story inside these two issues is also a top-notch effort by Stan Lee. I am unabashedly a child of the eighties. I’m sorry, but I grew up playing with the original Marvel Secret Wars action figures (along with He-Man, Transformers and Thundercats). As a result, I have an affinity towards that era of Spider-Man and specifically this cover of the villainous Venom overtaking Spider-Man. As a young reader of Spider-Man comic books, Venom was the first new villain I remember being introduced. He was menacing and psychotic. He also was a physical brute and (from my perspective) a real threat to Spider-Man. In Venom’s first appearance, ASM #300, I always thought that Spider-Man just barely escaped that encounter. Perhaps if Eddie Brock had a little more time to get to know the Venom symbiote, Spidey wouldn’t have been able to outsmart and defeat him. With that in mind, when I saw the front cover of ASM #316 for the first time as a kid, I was terrified. All I could think about until I opened up and read the issue was that Spider-Man was going to die. No way was he going to be able to escape a stronger and assumedly smarter Venom. Years later, I still look back at this cover as the definitive image of Todd McFarlane’s Venom and given the legacy of both the artist and the character, that explains this issue’s selection for my favorite covers list. Given the amount of notoriety he gained during his run on ASM, McFarlane’s time spent with the title was all-too short. McFarlane’s work certainly polarizes many Spider-Man fans. His over-the-top, exaggerated characters are an acquired taste for some, yet his Venom was, in many ways, the most conservative, and from my perspective, the best. 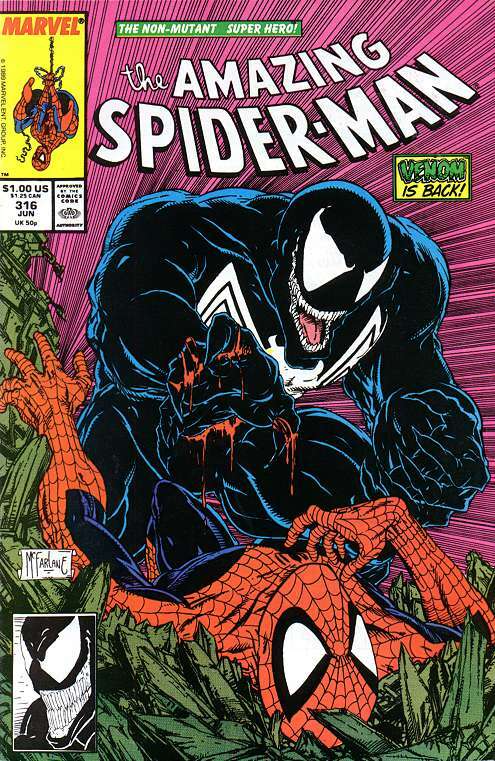 Years after his debut, many comic book fans would come to dismiss Venom for his cartoony slimey tongue and T-Rex fangs, but it was McFarlane’s interpretation – a bigger, stronger, more psychotic version of Spider-Man – that made him such an imposing and eventually popular character from the onset. However, if you’re one of those Spider-Man fans who prefers Doc Ock and Mysterio, my guess is this cover selection is going to really annoy you.